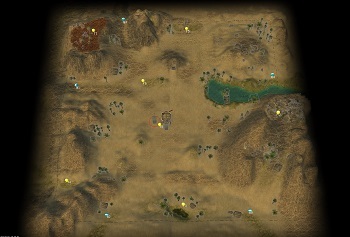 You have the task of gathering resources so that you can start building your next stronghold. The only area that is rich with resources is also an area of grave danger. There are many rogue troops that patrol these lands. They claim that these resources are their property and will try to attack all those that try to steal it. If you can hold off the attacks whilst you gather the resources we can abandon the area with them and start a new stronghold elsewhere. Keep your eyes open. We don't want anyone sneaking up on us. Good luck. I'm having an issue with this mission - when invaders take out one of my buildings, I cannot rebuild it because it states that the enemy is too close to build, even if there are no enemies on the map. It's making it difficult to beat because there isn't a lot of space to place buildings. Other than that, I'm enjoying the concept and challenge. a really nice and challenging scenario, that I didn't beat in my first attempt until I figured out how to start and to proceed economically. By the way I also got the message being unable to place any buildings because of the enemy's proximity, though there wasn't any of them. Weird or a bug? I had placed most of my buildings and workshops north to the keep ... anyway, victory was shown up on day 39 to inform you statistically. It doesn't matter what I try to build, it just acts like there is a nearby enemy and won't let me place anything. See the link at the screenshot below. Happy to send you a savegame if that would help you determine the cause. Not sure if restarting would help, but I suspect not if the user above has had the same issue. I unfortunately have not been as lucky in beating it because of it. The enemy destroyed my barracks and I could not replace it.